iLuv Creative Technology, the premier provider of the most comprehensive line of accessories for the mobile lifestyle, introduces their new line of premium accessories for the highly-anticipated iPhone 5S. All of the newly-designed iLuv cases will provide consumers with a fresh and diverse new range of options in materials, styles and price points when they are looking to express their individual sense of style in their mobile device cases. "iLuv not only strives to be first-to-market with cases for the latest Apple products, but we also aim to provide a wide range of innovative, high-quality and fashionable accessories to give consumers everything they want and need in their cases,” said Jason Park, Marketing Manager at iLuv. “Our new line combines multifunctional elements with everything from current fashion trends to timeless designs to offer a case for every mobile lifestyle. These new cases not only bring style and protection to the iPhone 5S, but also add value to Apple’s newest device." The new line of iPhone 5S cases includes classic iLuv designs everyone knows and loves while adding an abundance of new designs, including cases that are inspired by famous works of art and beloved Peanuts characters. •Elastic gore strips can be stretched from case to hold a stylus, cables, earphones, etc. 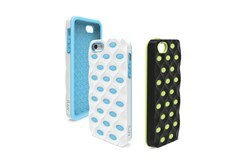 iLuv’s complete line of iPhone 5S Series cases and accessories are available at http://www.iLuv.com. Prices range from $ 9.99-$ 79.99.